Stef is not feeling this wedding between Eliza and her son, and Eliza's parents are mostly to blame for it. Lena tries to play peacemaker. 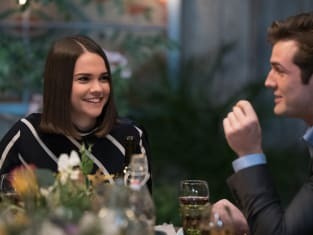 The Fosters Season 5 Episode 20: "Meet the Fosters", The Fosters Season 5 Episode 21: "Turks & Caicos"
The Fosters Review: Just Throw the Whole Family Away, Brandon! Jamie: Why do you assume all corporate lawyers are charlatans? Callie: Why do you feel you need to mansplain what my job is as a lawyer? Permalink: Why do you feel you need to mansplain what my job is as a lawyer? Stef: Kinda crazy that our kids have been dating for two years and we barely know each other. Not for lack of trying. Diane: Yeah, that's on us. Permalink: Yeah, that's on us. The Fosters Photo Preview: A Tale of Two Familes!